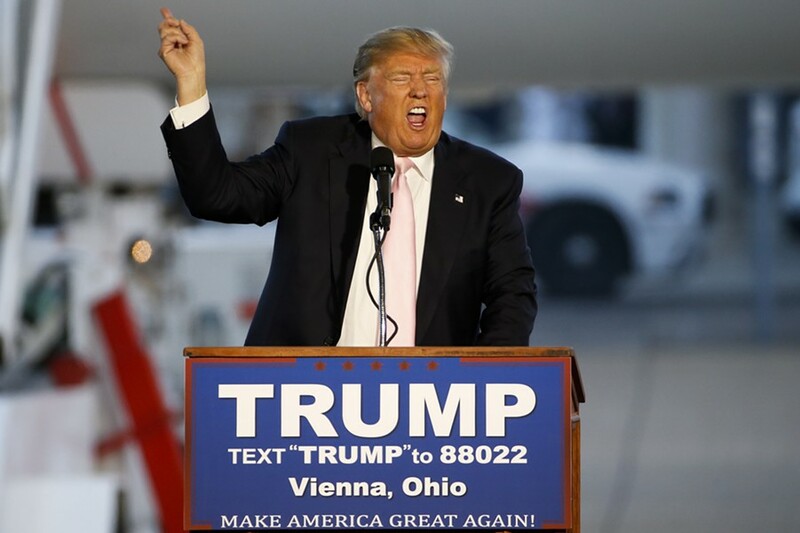 Donald J. Trump speaks Monday in Vienna, Ohio. Fearing a loss in Ohio to Gov. 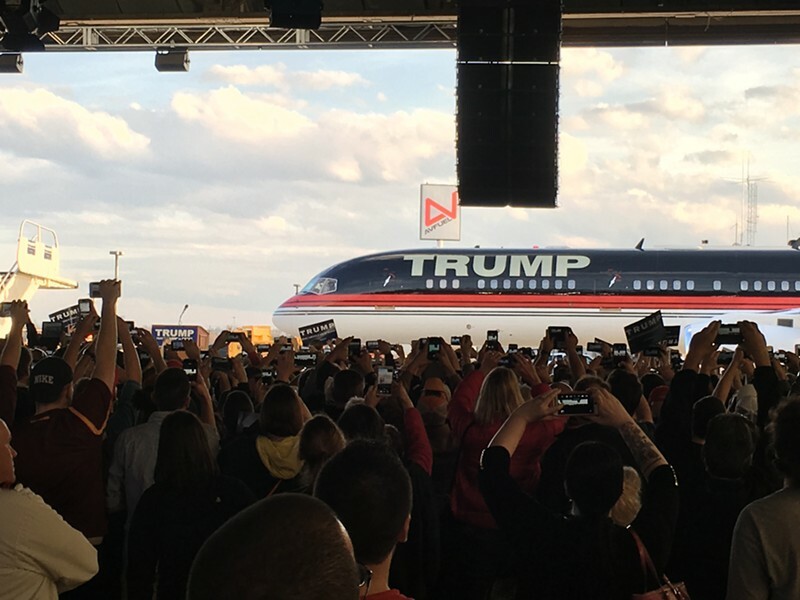 John Kasich, Republican real estate mogul Donald Trump rerouted his Boeing 757 on Monday from Florida to the Buckeye State for a primary-eve rally at the Youngstown-Warren Regional Airport. The Republican frontrunner’s visit to Vienna came just hours after Sen. Bernie Sanders (I-Vt.) held a rally 10 miles south of the airport in Youngstown — and two days after Trump accused the Vermonter of sending protesters to his events. But Trump didn’t mention Sanders’ name once Monday evening during his rambling, 50-minute exercise in free association. Trump supporters watch their candidate's plane pull up to a hangar at Youngstown-Warren Regional Airport Monday in Ohio. Instead, Trump focused his vitriol on his usual cast of Republican nemeses: Texas Sen. Ted Cruz (“Lyin’ Ted”), Florida Sen. Marco Rubio (“Little Marco”) and former Massachusetts governor Mitt Romney (“couldn’t run for dogcatcher”). None seemed as nefarious, in his view, as the news media, whom he called “the most dishonest people in the world,” prompting the crowd to turn toward the press section and jeer the assembled reporters. Trump even taunted New Jersey Gov. Chris Christie, who accompanied him to Ohio and introduced him at the rally. The two men appeared together at the door of the plane after it taxied to the hangar to the strains of the “Air Force One” theme song. Kasich, Trump said later, had neglected Ohio for months as he campaigned in New Hampshire ahead of its first-in-the-nation primary. Many in the crowd had gone to great lengths to hear their hero speak. They had been instructed by the campaign to park at a baseball stadium 15 minutes away and ride chartered buses to the airport. 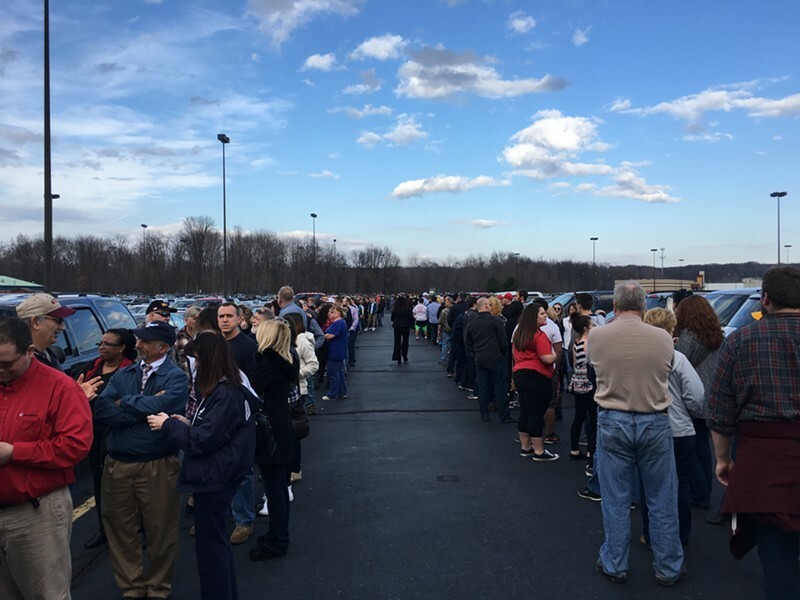 But the buses were few and far between — and many of those waiting in a serpentine line around the stadium’s parking lot failed to catch a ride before transportation to the venue ceased. 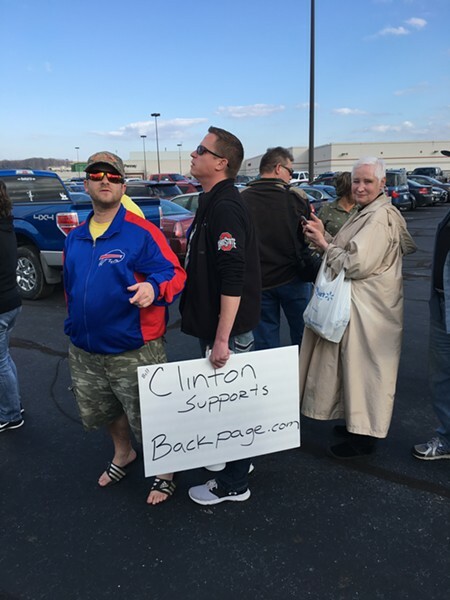 Trump fans wait in line Monday for a rally in Vienna, Ohio. Those who made it to the airport heard few policy proposals from their candidate, other than that he would build a wall along the Mexican border, impose tariffs on foreign-made goods and make better “deals.” But Trump did treat them to quite a surprise: a dramatic reading of Al Wilson’s 1968 song, “The Snake,” which Trump has performed at a handful of rallies. Trump prefaced his recitation with an explanation that the song — a story of a kindly woman who rescues a frozen snake, only to be bitten and poisoned by it — could shed some light on the wisdom of resettling Syrian refugees in the U.S.
“OK, are you ready?” he asked. “On her way to work one morning, down the path alongside the lake, a tender-hearted woman saw a poor half-frozen snake,” Trump began. As he read the lyrics to the crowd, the Republican frontrunner gesticulated wildly with his right hand — pointing and jabbing at the air. His voice adopted a menacing tone as he arrived at the denouement. Trump leaned into the microphone and joined them. “USA! USA!” he chanted right back at the crowd. 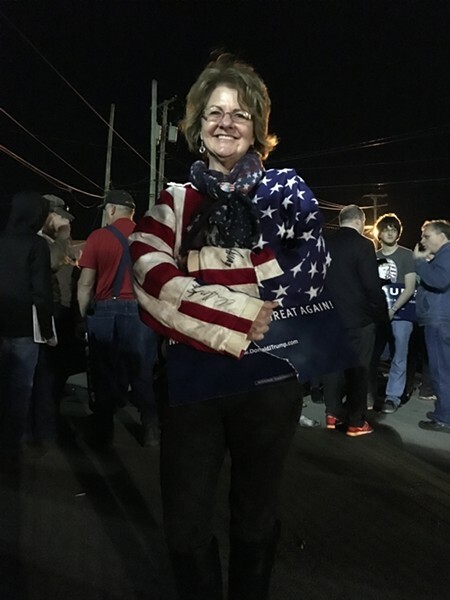 Outside the hangar, Trump’s fans expressed admiration for their candidate. 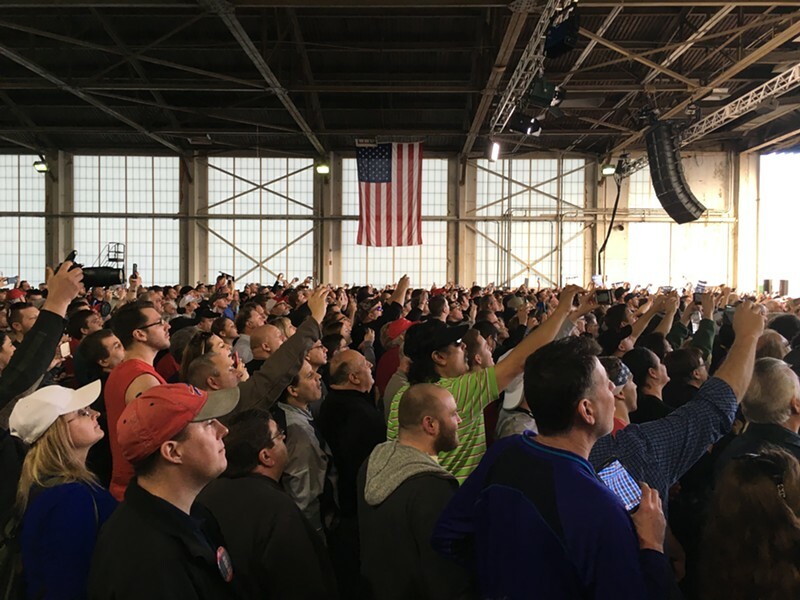 Anthony Grachanin, an automobile assembly worker on furlough from a nearby plant, said he had attended Sanders’ rally earlier Monday in Youngstown.